“Amish mafiosi” keeping code of silence? The much-discussed “Amish Mafia” premieres tomorrow, but the “sneak peek” is on tonight. Some reporters have been asking Amish experts what they think of the idea of an Amish mafia. Donald Kraybill calls it fiction, and David Weaver-Zercher says he first thought it was a parody sketch of reality TV. I have been hearing basically the same thing elsewhere–no one seems to know what the Amish mafia is, that Amish are “mystified” by this idea. Of course, if no one will admit to the Amish mafia, that doesn’t prove anything, now does it? We must be asking the wrong Amish people, I suppose. Sounds like conspiracy theory thinking may help this show along. Yesterday I watched the preview clips and read more about “Amish Mafia”. I learned that this group of 4 Plain vigilantes comprise “a secretive subculture that operates within its own rules and values”. At the beginning of each clip a shadowy bearded figure informs us, in Pennsylvania Dutch, that some of the scenes are reenactments “to ensure the safety of innocent Amish”. Apparently it can be difficult to tell which scenes are real and which aren’t, according to one writer who has viewed the first episode. In the clip below, we learn that group leader Lebanon Levi is “the cops, he is the courthouse, he is the bank, and he is the insurance company”. Levi sounds like a busy fellow. It must be hard work running Amish society behind the scenes. Please have Ray contact us – we have no phones. Real Amish workers will come to your jobsite and work very hard for you at a reasonable rate. We are very good wood craftsman. We can build you a post frame barn, any size. They emphasize that “real Amish” will do the work twice on the page. I imagine the person helping them probably created the text and content here, which uses promotional language I’d think would be uncomfortable for most Amish. This business is based south of Columbus, Ohio, in an area with numerous small Amish communities nearby. View the site here. Congratulations to Dave Goodman, winner of the “Seasons” matted photo series. Thanks to everyone who joined in our 3 Bill Coleman photo giveaways. If you think someone in your family would enjoy one of these photos, you can still order most items in time for the holidays. Here are gift suggestions for mom, dad, sisters, brothers, and more. You can also find some nice gifts for under $30, including posters and a photo book. You may have noticed the new “Amish Topics” link on the top menu. A few weeks ago Ed asked about a message board format to keep posts visible longer. I like the idea, if I can find a relatively low-pain way to do it. In the meantime I’ve gathered over 100 of the more active posts on this Amish Topics page, organized by categories (“Tough Questions“, “Amish Women“, “The Lighter Side“). We should have an improved search box up soon as well to make older posts easier to find. 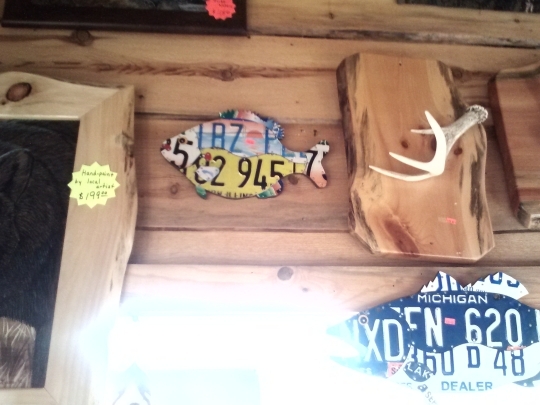 A man brought in some license plate art, wanting him to sell it. John didn’t think it would sell, but was persuaded to try two or three. They have been selling, so the man makes more. They are made by non-Amish and sold in an Amish-owned store. I have a funny feeling when I watch Amish Mafia, I’m going to feel like I’m watching Saturday Night Live. I guess it’s so secret they had to go public. I learned alot watching the very few that I believe really showed the light of their lifestyles and faith.. but the recent shows are just trash and its embarassing.. I live among the Amish here in Jefferson and Lewis Counties (New York)… They are hard working and polite, but do keep to themselves lest they become fodder for fools. Looks like another producer distorting and cashing in on a lifestyle other than their own. sadly most Americans only delve about an inch deep into given any – sad to say there will be a large numbers of people who will add this to their mental picture of what Amish is all about. Id Donald Kraybil says its fiction, I would have to agree. THe men don’t even look Amish at all. I might find a way to watch this first episode to see what this guy’s all about. Bold (or bold-seeming), complex characters are what these shows thrive on. People tune in to see what twists will happen from week to week. And now, especially after Breaking Amish, I think they’ll be tuning in to figure out what is authentic and what is embellished. I am sure I will also see at least a little of this program, as I did with the previous one. This is really sad if this is real of someone that clearly loves himself and looks like he is full of self pride? This goes against all the things i have read about the Amish?. Also more worring he seems a law unto himself, i guess the bishops are scared themselves, how can they sort this man when he seems to run there community, very scary even the peaceful Amish have heavy thugs if this is the case. Will pray for this community and its i guess very scared people. It takes a minute, but it soon becomes apparent that the guy that put this together knows something of the culture and is making light of the current buzz over Amish Mafia – be sure to check out the UPDATE button – it all becomes very clear with the photo on that page! Sign me, Still Laughing in Michigan! I got a good laugh out of that website. Thank you for sharing, Michigan Mary! This series could have been filmed in Ohio when the beard and hair cutting Amish cult group were attacking their own members for not “obeying” their orders. I would call that an Amish Mafia if there ever was one. I refuse to watch the show “Amish Mafia.” I also refuse to watch most of the other shows about the Amish that you find these days, with the exception of a couple of documentary-style programs that you find on PBS; most are simply exploiting people who aren’t in a position to object to the misrepresentations being made of them. I understand that people are fascinated by the Amish — I will admit to being interested myself — but there’s learning about them by reading, talking to actual Amish people, etc., and then there’s this kind of stupid exploitational TV fiction. I suspect the Amish are having a hard enough time coping with the world; the kinds of stupidity that people will end up thinking about them after programs like this one will only make that even more difficult for them! Ultimately, the Amish are people who have chosen not to live in the modern world but to separate themselves from it because of their faith, and I think they deserve a lot more respect and “hands-off” treatment than they’ve been getting. Whatever happened to the old philosophy of live and let live? Or even the Golden Rule? How to respond to Amish Mafia? That show now seems tame compared to these past 2 Amish programs on TLC and Discovery. I would suppose some Amish would be quite offended by the idea of this show, and I can’t blame them. On the other hand I think that many Amish have some healthy distance to this sort of thing, literally and figuratively. They’re simply not exposed to it as much on the one hand, but also because they end up developing that distance, being under the spotlight all the time. It probably depends on the individual person’s attitude as well. I’ve been going back and forth with one Amish friend on email since word of this show came out, both of us sneaking in jokey Amish mafia references from time to time. All bad connotations of the real mafia aside, I guess if something seems absurd the best response may be humor. By viewing the video clips here, I’ve already seen too much of the “Amish Mafia”. I refuse to waste my time on this…poop! As for Cow Patty Bingo, it’s something that goes on in my area to raise money for charity, during county fairs and other summertime festivals. No big deal there, not to me, anyway. Actually,the cows seem to be making a thoughtful statement about the whole ^@$^*&%! !_^$##^** show 😉 ! Nice connection Alice Mary. Maybe not the best clip to include in the preview batch of videos. Erik, Mary — On the way home from work, either yesterday or the day before, I had to explain cow pie bingo to my husband. Being a good suburb/city boy, he had never heard of it. Being a good country reporter and campus minister, I was very familiar with this fundraiser. Their little game of bingo came on as a segment and we both laughed very hard at it! The irony of the timing was too funny for us – and for me, I had never heard of anyone playing it as an individual game, but always as a fundraiser, including my own college! Funny timing Karen. Since you mention fundraiser I wonder if this has ever entered the picture at Amish benefit sales. This show is distasteful, shameful, should be banned and canceled. nice, people. When people homes burn they are always the first there to help, a death in the family amish or not they bring food, neighbors need help building a barn or whatever they lend a helping hand. They do not believe in tvs or modern technology who are we to judge them for their beliefs. I think this falls under the heading of dumb and dumber. The producers and directors must have been bored with themselves and found this amusing in their eyes so perhaps they need to find a new way to amuse themselves produce and direct some half way decent show not trash. Laura, Alice Mary, and Nicole summed it up correctly. I never understood why some people look for the bad in things….even when there isn’t any. As a Quaker, I have always looked for the good. We all know that no one is perfect, but exploiting other humans for monetary reasons is shameful. Okay, well I didn’t get home until the program was half over. I watched 7 or 8 minutes of it. It was that good, eh. Beyond ridiculous. I’m embarrassed for somebody…producers? actors? willing viewers?…I just don’t know who. I think I just wasted an hour watching this, as Alice Mary said, poop! I won’t be watching it next week. This is most likely fiction. It does, however, seem to be based on some facts and real things in the Lancaster community. This includes one of the “members” really have a long police rap sheet and being involved with the things “Levi” tasks him to do. Having worked with young adults in a religious setting, I can imagine a group of them feeling they have a “responsibility” to protect the community’s’ mores and members, even to the point of allowing themselves to transgress those same mores “because it’s necessary.” Would Amish or ex-Amish young adults feel the same? I need to leave the definitive answer to experts who know the Amish better than I do, but I will hazard the guess that this would not be tolerated by the community leaders as is implied in this show. Most of the things they run around doing are actually jobs for the deacons: calling people on immoral or straying behavior, supporting widows and protecting their reputations, working with business owners to find solutions that meet the Ordung’s requirements and the businesses needs. Would the community tolerate a group of extra-judicial young men playing at the deacons’ role in this manner? I doubt it. The claim of “insurance” is really extorting protection money. The Amish, as we have been told, don’t buy insurance. I cannot fathom a business paying protection money for many of the same reasons. As a people who wish to emulate their martyers, they’d rather their business be burned down than pay protection money. All, this Levi’s claim that his little gang throws rumpsringa parties as a safe place for the teens to let loose is also just a cover up for running an illegal dance bar/speak-easy. Again, I don’t see it tolerated. One anonymous phone call would shut that down pretty easily. The soap-opera of “our dad had Levi’s position and so our brother should have it now” is intriguing. To be a father, this dad would have to had be baptized – but Levi makes a point of stating his little gang is unbaptized so to intentionally be outside of the bishops’ control. So the elder generation, which we are led to believe have died, had to have been baptized. They couldn’t have done the things this current generation claims to be doing and claims to have been done before them. That is the biggest whole in this entire script. Also, the whole thing with the Chinese made “Amish” goods being sold in the stores, which is causing store owners to pay less in protection money. How these young men claims to have “solved” it is the biggest and silliest point of fiction. There are lots of English store selling cheap Chinese made imports as Amish good – true. But by scaring the heck out of one driver and stealing the shipment to one store, you cannot solve this problem! It makes a good story, but it is the least realistic part of this silliness. So, there’s your review. My guess is these are ex-Amish wanna-be thugs who are neither in nor out of the community, because real mafia do terrible things – including murder, which these young men seem reluctant to do – and certainly wouldn’t be on TV with their secret gang of Mafiosos. While I can see a group of older men “discussing” situations that are unbecoming, this just doesn’t make sense to have these young, unbaptised men doing the elders’ job in a threatening way. Young men’s Amish fiction is what I’d call it. I haven’t viewed this first episode yet, but this seems very insightful Karen. Thanks. What you describe as their tasks is sort of what I suspected–there must be some sort of a basis here upon which to build a show, but it seems a stretch that these activities would be widely sanctioned by the church, tacitly or explicitly. Even if a system like this were to develop in one community, is a system of enforcement outside the church the norm for “the Amish”? If so, they’ve been keeping the secret well all these years. To one of your other points, I have come across former Amish/Amish-raised folk who are defensive of their previous culture in an almost agressive manner. Perhaps this is the same phenomenon taken to an extreme. This show sounds like made up drivel. What’s next- “Amish Zombies” or “The Real Housewives of Holmes County?” I find the OFF button on the TV to be quite useful. I have watched the show, but it appears fake and just for entertainment. Unfortunately, I can imagine people thinking this is real life for someone in the Amish community. I do not know anything about the Amish community, but it feels too far-fetched. My impression of the Amish is hard working, community focused, simple and dedicated way of life. I admire the true Amish for having such a focus and not following the ‘progress’ of society. I think they keep a knowledge alive that the “English” have lost in just a few generations.